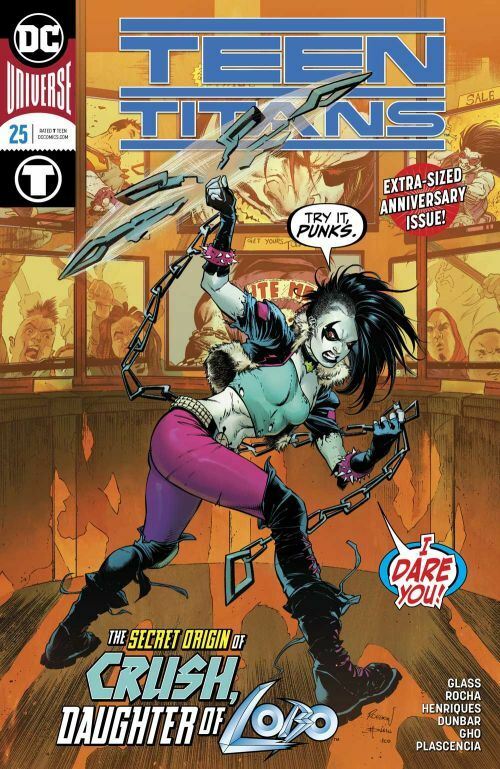 Teen Titans 25 is a double sized anniversary issue, and contains two stories, each of which spotlight one of the newer members of the team. The lead story centres on Crush, the apparent daughter of Lobo. I was expecting something along the lines of the Lobo: Infanticide miniseries, as that tale contained loads of Lobo’s offspring. Instead, we get a tale that bears more than a passing resemblance to the Superman origin, at least, the part after he lands on Earth. Lobo is more than likely Crush’s father, but that is not known for certain. Her adoptive parents found her during Burning Man, when he ship crashed to Earth, and took her in and raised her. But these were not the Kents. Crush’s new parents were criminals, and her life starts on a dark path right away. The story also emphasizes the nature of her chain. I had thought it merely a weapon, but it becomes pretty much a sentient sidekick here. Excellent art on the story. I liked the character from the get-go, and this just made her all the more interesting. The second story features Roundhouse, and fills us in on how he survived his fall to Earth a couple of issues back. It’s cute, and we get to meet his sister, Claire. It’s not a bad story, and the art is quite good. But it really does pale next to Crush’s tale. But even if the Roundhouse tale is weaker, this issue still packs a punch, and is a must read for anyone interested in the book.